Technical Car Experts Answers everything you need: air flow meter problem on ALFA 156? air flow meter problem on ALFA 156? Air Flow Meters measure the amount of air passing into the engine from which the computer can work out how much fuel to add to get the perfect mixture for that specific throttle opening, the computer does this by referring to a map in its memory. The Air Flow Meter works by seeing how much current it takes to keep a wire at a specific temperature. However it is a sensitive instrument and it can be contaminated by oil (often used in aftermarket performance air filters), damaged by excess vibration caused by broken air boxes and we have seen problems with GTV 3.0 litres being fitted with 2.0 litre filters which leaves about an inch gap through which contamination gets in. One way to confirm would be to pull a few spark plugs and see if they're severely carbon-fouled (i.e. black). This indicates that your engine is running super rich, and likely points to the AFM. First is to clean the carbon out of the idle motor channels and the throttle body. Then check for excess back pressure in the exhaust system. Take out the O2 sensor and install a fitting to attach a pressure gauge. At 2000 rpm there should be less than 2 psi showing. 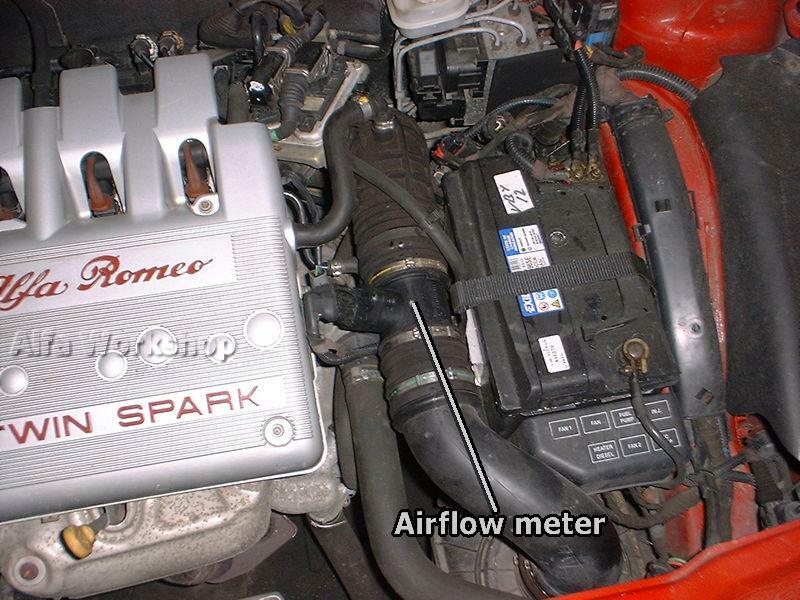 Labels: air flow meter problem on ALFA 156?